A Little Day Music is the longest running free concert series in Houston. This month’s event celebrates A Little Day Music’s return to the Wortham Center. 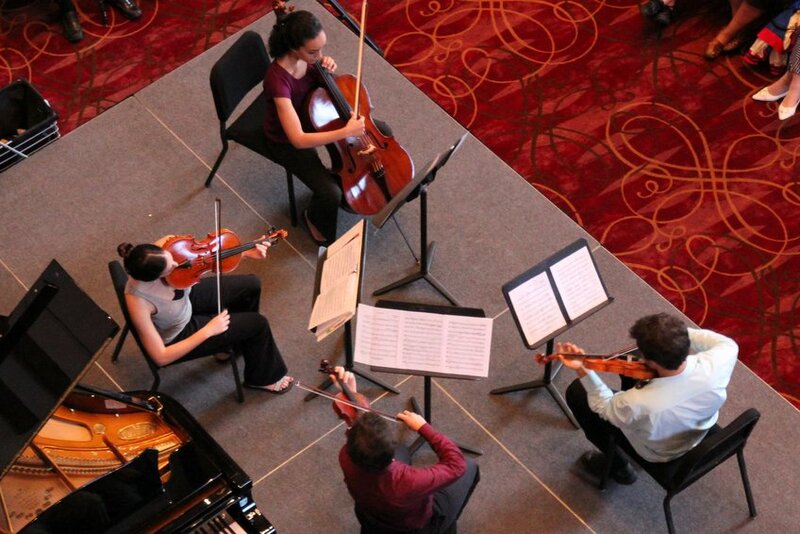 A Little Day Music is a series of free concerts presented at noon on the first Wednesday of the month in the Grand Foyer of the Wortham Center. Each concert is designed to deliver Da Camera’s signature programming to an audience including senior citizens, downtown professionals, and students. The series features a variety of chamber music and jazz, presented in an accessible one-hour concert format. Audiences are invited to enjoy their lunch while listening to the music. Bring your lunch, bring your friends. No reservations or tickets required. Parking information. Please be advised that the tunnel from the Theater District Parking Garage to the Wortham Center is closed until further notice. We suggest investigating other options such as the Alley Garage or other nearby garages or parking lots. For groups of 10 or more, call 713-524-7601 ext. 19.